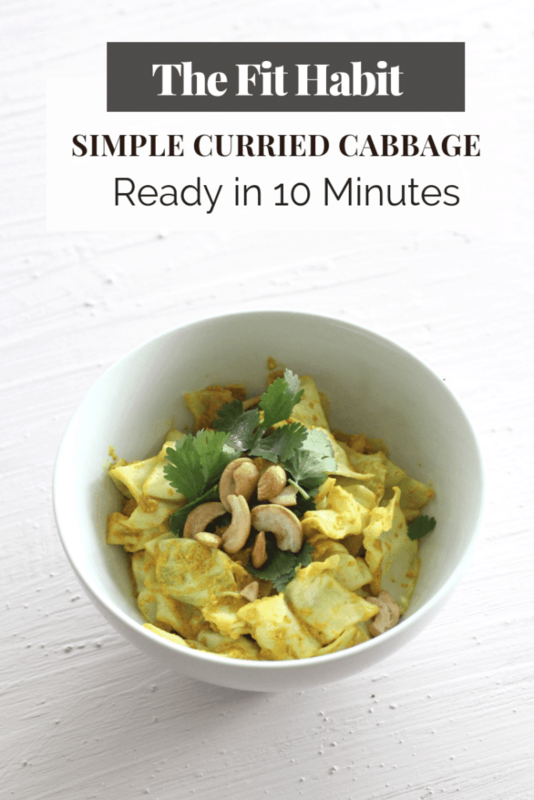 I found a more complicated version of this recipe on Kitchn when I was searching for ideas to make cabbage taste good. This should say something about my thoughts about cabbage going into this experience. I didn’t have the spices they called for, so I decided to make my own version that’s much simpler, and surprise, surprise, it ended up tasting really, really good. It’s really inexpensive! A head of organic cabbage only costs about $2.50 and greek yogurt – about a buck. It’s a great source of protein (give or take 10 grams per serving) with lots of fiber. It’s the perfect alternative to take out. Cabbage will sit in your fridge for weeks before spoiling, so when you have nothing else – cabbage and yogurt to the rescue! What kind of greek yogurt should you use? I used 0% for this recipe which is lower in fat and higher in protein. I don’t think the fat count is as important as the texture and quality. With that, I recommend Fage. It’s by far my favorite. Trader Joe’s is a close 2nd. No. Flavorful, yes, but not spices with heat (at least I don’t think so). 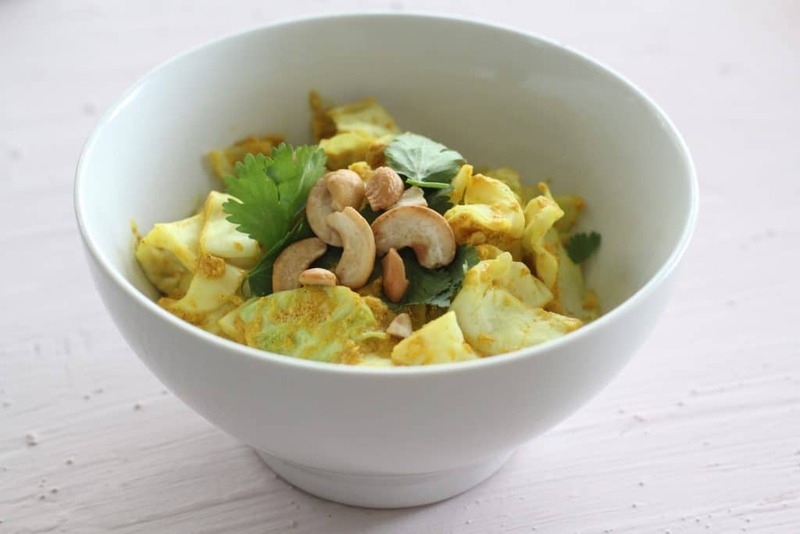 Are you a fan of curried recipes? A quick and simple curry recipe with just a few ingredients that won't disappoint. Double up on the ingredients to make a big batch and eat it all week! Chop cabbage into bite-sized pieces and rinse in a colander. Pat dry and set aside. In a medium saucepan, add 1 tablespoon of oil and minced garlic. Stir for one minute as pan heats up. Add the 1/2 cup of yogurt, then stir as you add the 2 tablespoons of garmsala. Mix everything well. Now add in the chopped cabbage and mix until it’s well coated in the mixture. Add a lid to the pan and let cook for about 5 to 7 minutes, stirring occasionally until cabbage wilts. 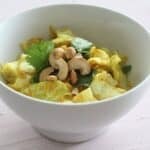 Sprinkle with 3 tablespoons of cashews and serve!